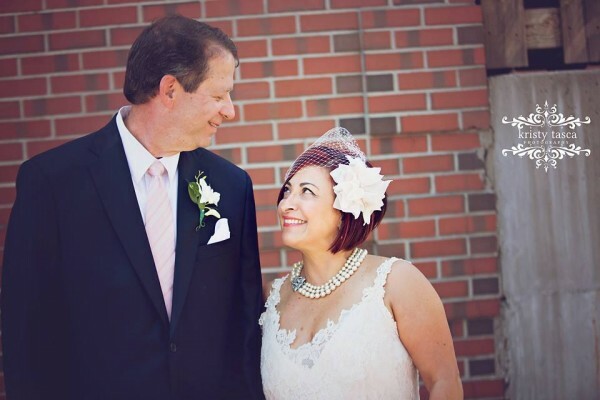 Terry had a dress that she has loved for years and when she married her sweetheart this summer, she knew it would be perfect for the special day. 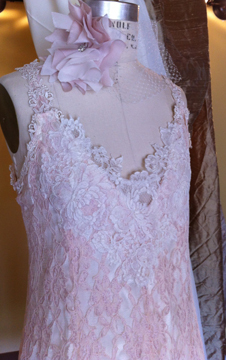 She wanted to make it just a little extra special for the wedding, so we opened up the front neckline and added a piece of beautiful, alencon lace to compliment the dress. We also created her bircdcage veil with a custom fabric flower hand crafted from our friends at LeeAndis Purple Roses! Thanks for sharing your beautiful day with us Terry! You look so lovely!